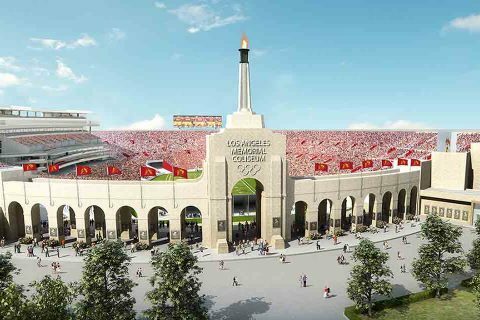 USC today formally kicked off the $270 million renovation project that will preserve and improve the historic Los Angeles Memorial Coliseum, the 95-year-old home of the USC Trojans. “For more than a century, the Coliseum has been the historic home of some of our city’s most spectacular events,” USC President C. L. Max Nikias said to several hundred dignitaries, donors and friends of the university at today’s groundbreaking ceremony. The first football game was Oct. 6, 1923. 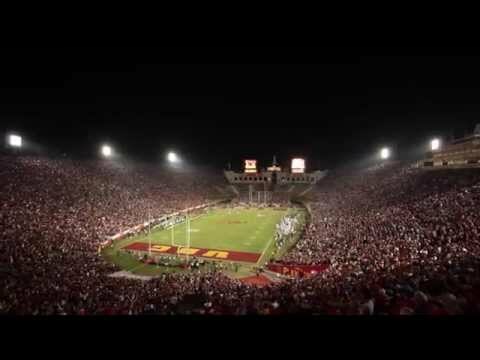 USC defeated Pomona College 23-7 before 12,836 people. With the 2028 Summer Olympics, it will be the only stadium to have hosted three Olympics. The soil being unearthed as part of the renovation work hasn’t seen the light of day in nearly a century. The Dodgers-Red Sox exhibition March 29, 2008, set a world record for the largest attendance ever at a baseball game: 115,300. The Billy Graham Crusade on Sept. 8, 1963, drew the stadium’s largest crowd ever: 134,254. USC’s athletic director, Lynn Swann, recalled his first time entering the renowned venue as a USC football player, and thanked the many donors whose generosity made the project possible. “It is indeed an investment in today’s champions and tomorrow’s leaders,” he said. The stadium — the only venue in the world to have hosted two Olympics, two Super Bowls and a World Series — will host the opening and closing ceremonies as well as track and field events during the 2028 Olympics. It has been the Trojans’ home field since it opened in 1923. 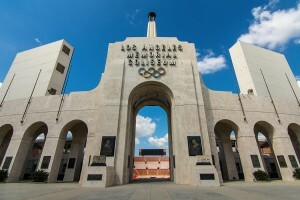 The Coliseum is jointly owned by the state, the county and the city of Los Angeles, and is managed and operated by USC under a 98-year lease that extends through 2111. 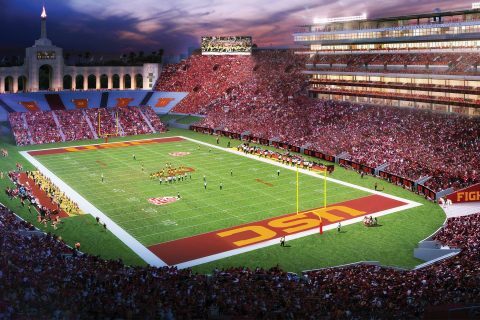 The renovation work — privately funded by USC without any university funds or public money — is scheduled to be completed for the 2019 home opener. 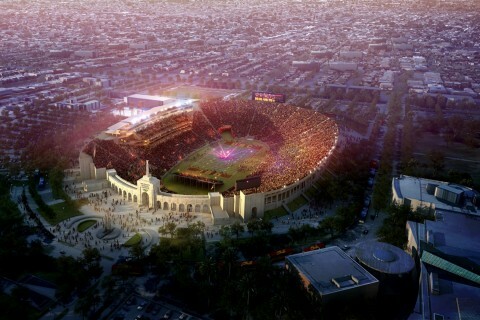 The Trojans and Los Angeles Rams will continue to play at the stadium during the project. Building a new structure on the south side of the stadium — the Scholarship Club Tower — that will house suites, loge boxes and club seats, topped by a new press box. Replacing every seat and installing handrails throughout the stadium. Adding aisles, increasing legroom and widening seats in many sections. Upgrading entry concourses and installing new field and stadium lighting. Improving Wi-Fi service and replacing the electrical, mechanical and plumbing systems to meet current standards. Already in place are two massive new video boards on the stadium’s east end. 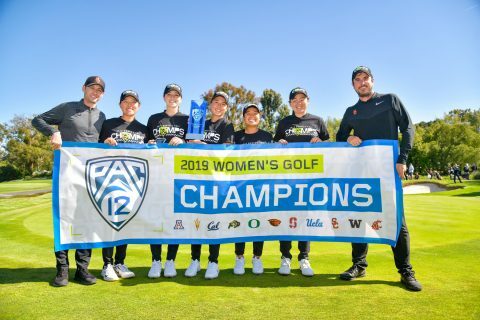 Earlier this month, the university announced a $7.5 million gift from the Argyros Family Foundation to name the venue’s peristyle plaza the Julia and George Argyros Plaza. And today, a 16-year agreement was announced to help fund the preservation and enhancements that will rename the renovated facility the United Airlines Memorial Coliseum. 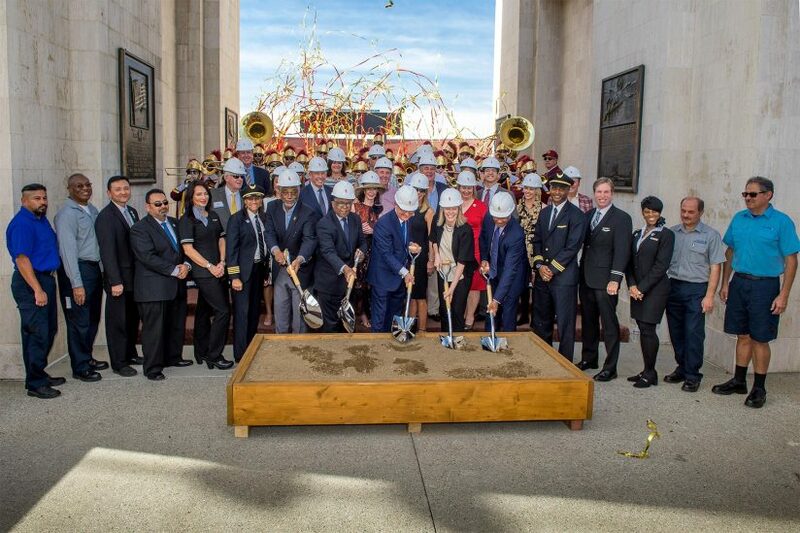 Among those attending the groundbreaking was Trojan and United pilot Melissa Ward ’86, the first female African-American captain for a major U.S. airline. Ward played on USC’s 1983 and 1984 women’s NCAA championship basketball teams. The Coliseum was designed by father-and-son architects John and Donald Parkinson and modeled after the original Roman Colosseum. The pair also designed the Gwynn Wilson Student Union, Physical Education and Bovard Administration buildings on the USC University Park Campus, as well as Los Angeles City Hall and Union Station.